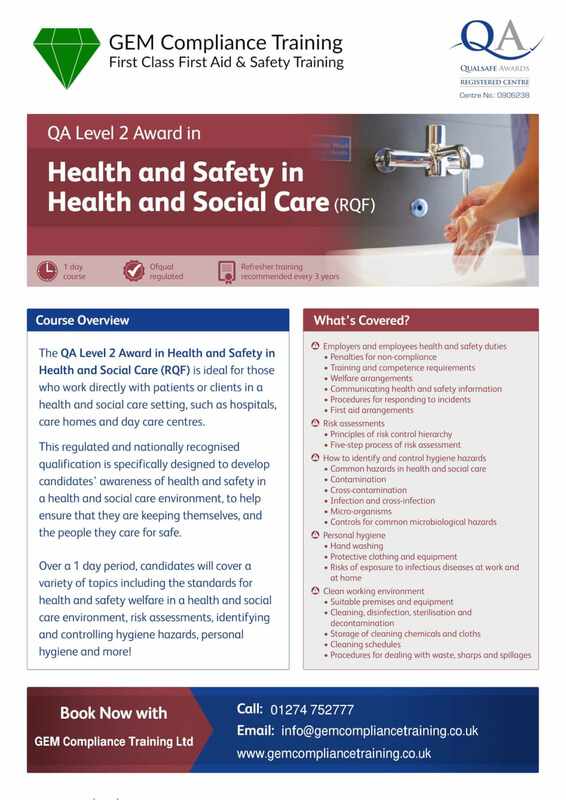 This course is specifically designed to develop staff members awareness of health and safety in a health and social care environment, to help ensure that they are keeping themselves, and the people they care for safe. Over a 1 day period, delegates will cover a variety of topics including the standards for health and safety welfare in a health and social care environment, risk assessments, identifying and controlling hygiene hazards, personal hygiene and more! Assessment is on-going by the instructor, followed at the end with a multiple choice question paper. Upon successful completion, attendees will be awarded a nationally recognised Ofqual regulated certificate. This Health and Safety Level 2 qualification does not expire, but refresher training and keeping up to date with changes to policies and procedures is vital to keep the qualification current. We can arrange to deliver our Health and Safety Level 2 training courses in your workplace to groups of 6 or more. Courses delivered in your workplace can be delivered during business hours or on evenings and weekends to suit your needs. Bespoke training packages can be provided and we can offer discounts on block bookings. We pride ourselves on our flexible approach in meeting our client’s needs.